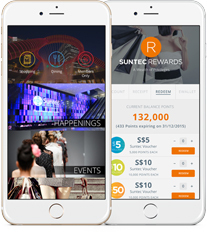 The nearest MRT Stations are Esplanade Station and Promenade Station via the Circle Line and Downtown Line which will bring you directly to Suntec City. Alternatively, take the MRT to City Hall Station, followed by a five minutes walk via an underpass to Suntec City. 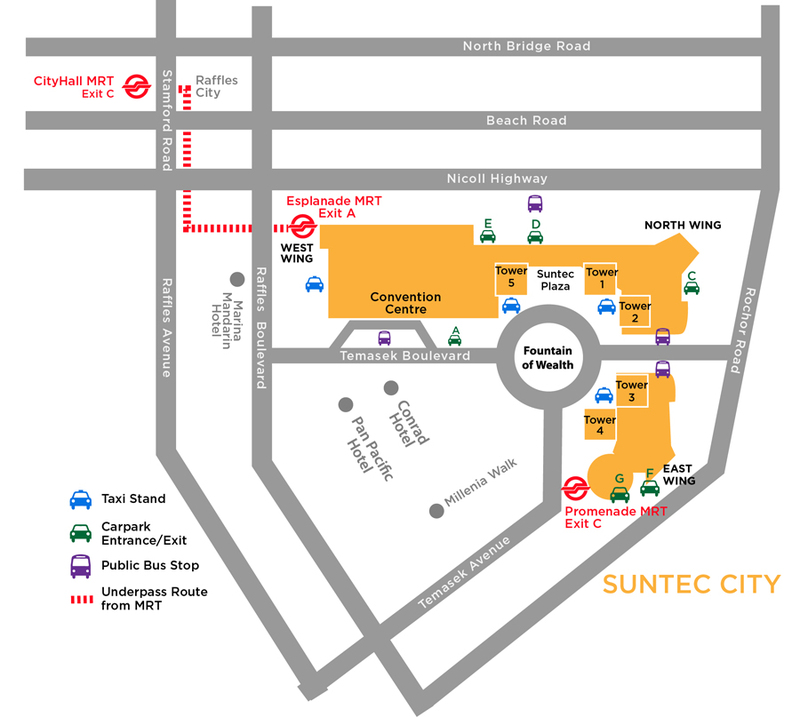 Suntec City owns the biggest car park in Singapore, with 3,100 lots spreading over the entire development. A car park guidance system assists motorists in seeking out vacant lots quickly, while a mechanical parking system helps make full use of available parking space. 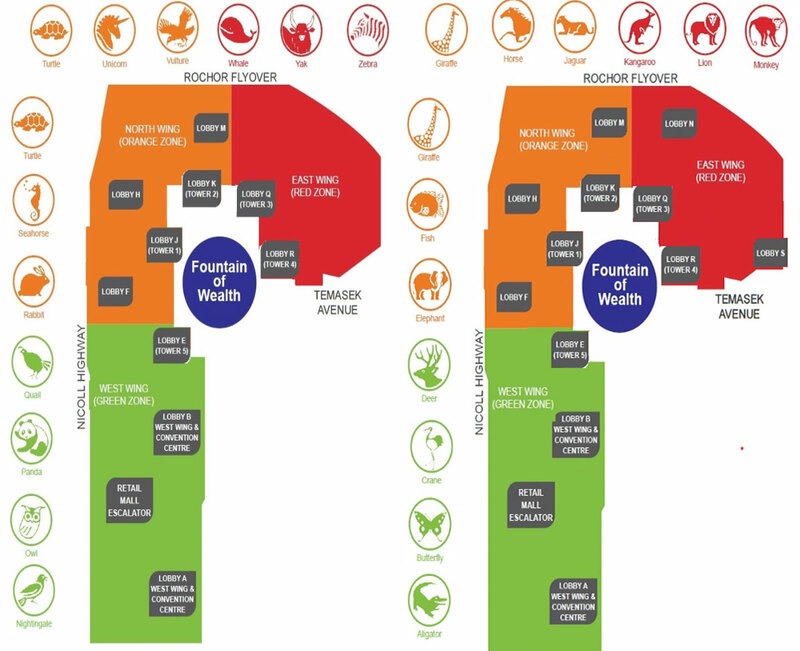 3 color zones and 24 distinct animal symbols are adopted as easy reminders. 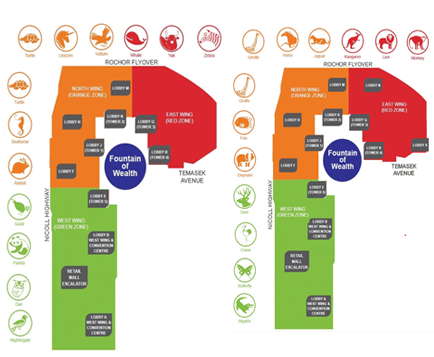 There are lobby leaflets at all lift lobbies to assist visitors to remember which animal zone and lift lobbies they had come from. There are directional signage on the columns and column numbers to assist you to find the location where you had park your car, should you are unable to locate your car there is a 24 hour hotline number in the leaflets to contact for assistance which will dispatch a buggy to assist you to your car. The Management Corporation Strata Title Plan No. 2197 accepts no responsibility whatsoever for any theft, damage or other misdemeanour to vehicles parked in the car parks or any premises within the development. All vehicles are parked at the owners’ risks. The use of the car parks is subject to the provisions of the Parking Places Act and the Rules made thereunder. Vehicles will be clamped for unauthorised parking in the car parks. An administrative charge of $100 (subject to GST) will be imposed for the removal of the wheel clamps. Vehicles will be clamped for failure to pay outstanding carpark charges. An administrative fee of $30.00 per occurrence will be imposed for every incident of non-payment of outstanding carpark charges. The Management Corporation Strata Title Plan No. 2197 accepts no responsibility whatsoever for any theft, damage or other misdemeanour to vehicles parked in the car parks or any premises within the development. All vehicles are parked at the owners’ risks. The use of the car parks is subject to the provisions of the Parking Places Act and the Rules made thereunder. Vehicles will be clamped for unauthorised parking in the car parks. An administrative charge of $100 (subject to GST) will be imposed for the removal of the wheel clamps. Vehicles will be clamped for failure to pay outstanding carpark charges. An administrative fee of $30.00 per occurrence will be imposed for every incident of non-payment of outstanding carpark charges. S$5, S$10 and S$50. You may purchase them at any Customer Service Desk daily. 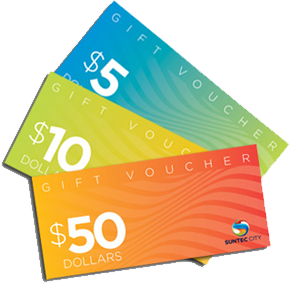 For corporate purchases, please email sunteccity@apmasia.com.sg.